When there are lives at stake, no one wants to make compromises. With the MSA AirXpress no one has to. 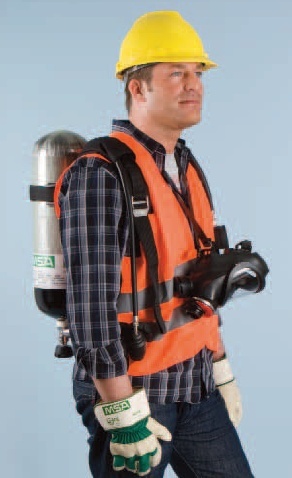 In building the AirXpress, an SCBA system made for tight budgets, MSA has concentrated on those features most essential for safety and performance. High volume manufacturing processes specially designed for this stream lined system and progressive logistic methods make it possible to offer the MSA AirXpress at a price normally not available for such high-caliber professional systems. What we haven't sacrificed are the standards you've come to expect from products that carry the MSA label. To meet the specialised demands of industry and emergency response, the MSA AirXpress comes in two configurations: AirXpress Industrial and AirXpress Fire. MSA Quality - World-reknowned MSA quality combined with advanced tech - nology make the MSA AirXpress an outstanding value in SCBA equipment. The first-stage pressure reducer is the same one used in all MSA systems. This patented and choice component distinguishes itself through reduced parts and low maintenance - and that translates into reduced cost of ownership. MSA Tough - Like our other SCBA systems all components on the AirXpress are designed to last long in rugged circumstances. They are EN137:2006 approved to withstand high temperatures, flames and rough handling plus they are intrinsically safe and ATEX-approved for zone 0 environments. MSA World Class - MSA has offices in over 140 countries around the world. Qualified and friendly MSA staff are not far away to assist you with prepurchase evaluations and a complete program of after-sales training and service - wherever you are. Air lines are built close to plate for swing-free operation. Harness with adjustable, padded shoulder straps and hip belt. Extra-secure fasteners are made for quick on and off. Ergonomic AirXpress carrier made with glass fibre reinforced polyamid to withstand high heat and flames. Integrated transponder for efficient inventory management. LA 96 demand valve with positive pressure plug connector is connected directly to the first stage reducer. Warning signal for added safety. Optional second connection for fire rescue or airline connection. Harness with adjustable, padded shoulder straps and hip belt. Extrasecure fasteners are made for quick on and off. Aramid blend material for extra durability. AutoMaXX-AS demand valve with positive pressure MaXX plug connector is connected directly to the first stage reducer.